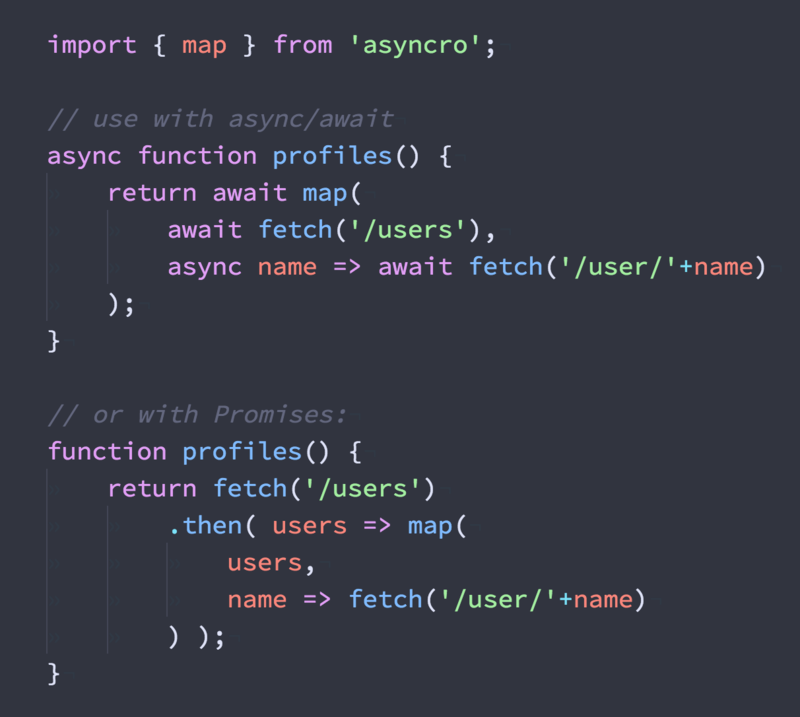 The same map(), reduce() & filter() you know and love, but with async iterator functions! Do fetch() networking in loops, resolve Promises, anything async goes. Performance-friendly by default. Invoke an async reducer function on each item in the given Array, where the reducer transforms an accumulator value based on each item iterated over. Note: because reduce() is order-sensitive, iteration is sequential. Invoke an async transform function on each item in the given Array in parallel, returning the resulting Array of mapped/transformed items. This is an asynchronous, parallelized version of Array.prototype.map(). mapper Function Async function, gets passed (value, index, array), returns the new value. Returns Array resulting mapped/transformed values. Invoke an async filter function on each item in the given Array in parallel, returning an Array of values for which the filter function returned a truthy value. 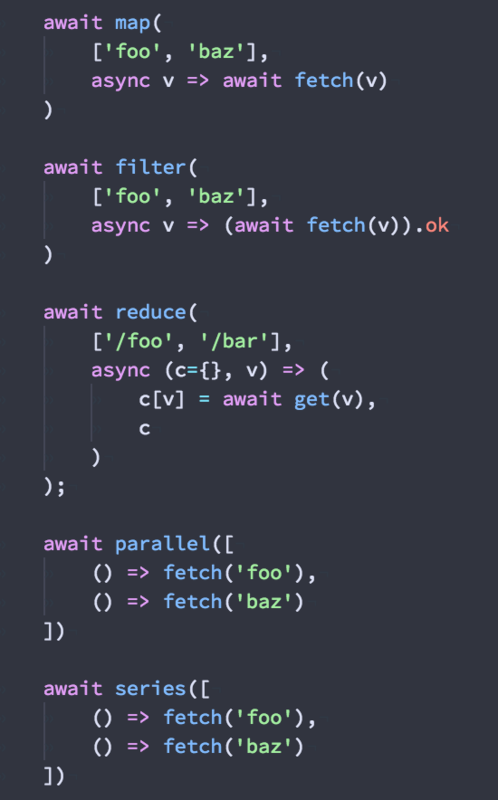 This is an asynchronous, parallelized version of Array.prototype.filter(). filterer Function Async function. Gets passed (value, index, array), returns true to keep the value in the resulting filtered Array. Invoke an async function on each item in the given Array in parallel, returning the first element predicate returns truthy for. This is an asynchronous, parallelized version of Array.prototype.find(). predicate Function Async function. Gets passed (value, index, array), returns true to be the find result. Checks if predicate returns truthy for all elements of collection in parallel. This is an asynchronous, parallelized version of Array.prototype.every(). array Array The Array to iterate over. predicate Function Async function. Gets passed (value, index, array), The function invoked per iteration. Returns Boolean Returns true if all element passes the predicate check, else false. Checks if predicate returns truthy for any element of collection in parallel. This is an asynchronous, parallelized version of Array.prototype.some(). filterer Function Async function. Gets passed (value, index, array), The function invoked per iteration. Returns Boolean Returns true if any element passes the predicate check, else false. Invoke all async functions in an Array or Object in parallel, returning the result. list (Array<Function> | Object<Function>) Array/Object with values that are async functions to invoke. Returns (Array | Object) same structure as list input, but with values now resolved. Invoke all async functions in an Array or Object sequentially, returning the result.